The third proverb attributed to King Solomon, known for his wisdom, exhorts the reader to remember the Lord’s teachings. This is a wisdom teaching on the readiness and willingness to acquire wisdom. To acquire wisdom we must be upright and trust in the Lord. Only those who are loyal and true are worthy of the gift of Wisdom. The only requirement is personal dedication to the Lord, a positive personal relationship with God that leads you to always be aware of God’s presence and to make offerings to God as a token of your reverence to Him who has given you everything. 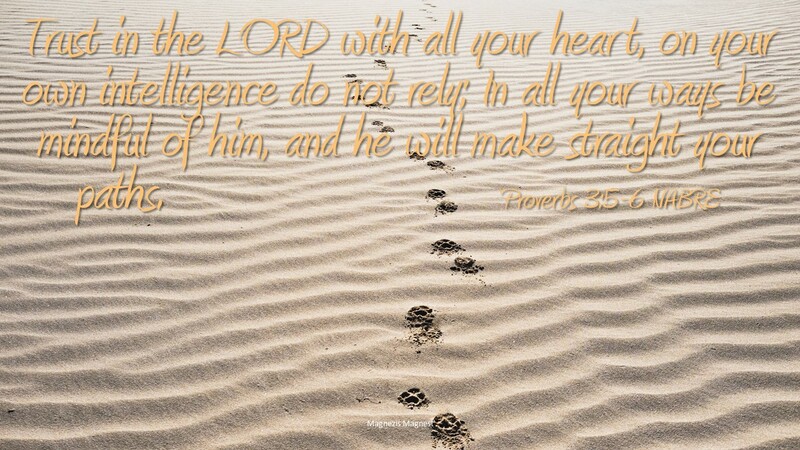 We read to trust in the Lord with all our heart, and do not rely on our own intelligence. Kind of the opposite of what we are taught in school, by our parents, in the world in general. We are taught to be smart and use our head. I can still hear my father saying it to me every time I screwed up. But, the teaching of wisdom to gain wisdom is to put all our trust in God and not in our own capabilities. We are further advised to think of God in every situation, and God will make sure our way is true. It takes strong faith to live with complete trust in God and letting go of our own desires and thoughts. Wisdom is teaching we are wise to depend totally on God. It takes discipline to follow wisdom. We all act out of our own analysis and decision making and while we don’t always get it right we know why we are doing the things we are doing. God wants the best life for us and therefore prefers we rely on His Wisdom to attain what is best for us in life. Following God’s way is the wise way. How do you check with God on direction? How do you decide things?